Last month, a group of friends and I headed out for some Korean BBQ. Ginseng Restaurant specializes in an all-you-can-eat, cook-it-yourself BBQ buffet. About half of the buffet has a variety of marinated raw chicken, beef and pork, as well as seafood such as shrimp, mussels, clams and squid. 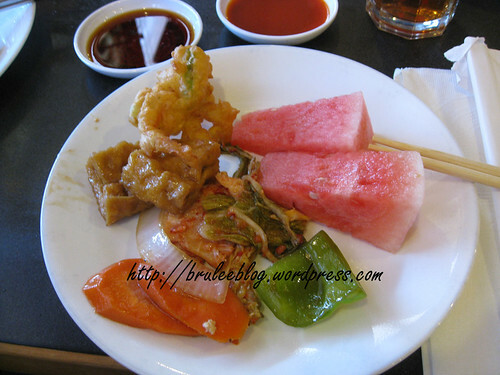 The other half has cooked food such as rice, noodles, tempura, kimchee, tofu stir-fry, etc. Each table has a built-in grill set in the middle. You’re given tongs to use to cook your food, and away you go! The metal grill plate gets covered with blackened fats quite quickly, and a waitress came by often to replace our grill plate with a clean, newly oiled version. I was happy with the variety that Ginseng offers on their buffet table. The marinated meats ranged from mild to spicy, and the cuts weren’t too bad. I liked that they cut up vegetables for the grill as well. If you go, go early as the place fills up quickly. Also, be aware that you will walk out of the place reeking of meat and smoke. There are giant vents over each table (like those that you would find over a stove), but it didn’t seem like the restaurant actually turned them on. The room had a visible haze of cooking smoke by the end of our meal. It also probably didn’t help that the table behind us kept burning their food. All of us smelled like meat for the rest of the evening. The buffet costs $29 per person and includes non-alcoholic drinks, but not dessert other than the fruit that is on the buffet table. 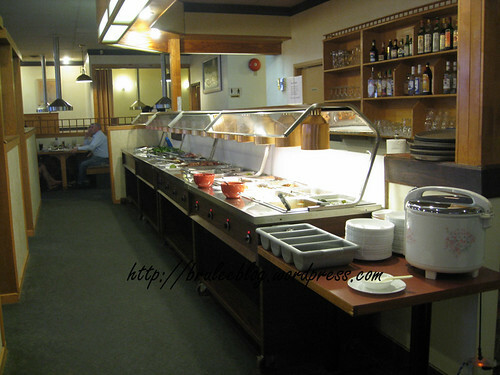 The restaurant also has a regular menu, but everyone there seemed to eat from the buffet. The lack of ventilation is a turn off for this asthmatic – but the meal sounds delicious and like a lot of fun!! I love food like this!! ANything communal always appeals to me. If you go really early and don’t linger you might be ok. And maybe bring your inhaler. 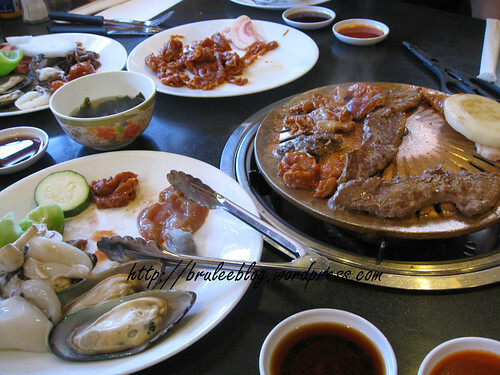 I think one of the few things that turn me off from AYCE Korean, is the smell. Having spent my youth at McDonald’s, I try to avoid smelling like a grease pit these days..except I still find myself mowing down once in a while. I can’t believe you made it down to my side of the city for a dinner, as I can almost smell Ginseng from my place. I used to work in a cafeteria during high school, so I know exactly what you mean. And yes I do make it over there once in a while. Just not that often! Wow, haven’t been to Ginseng here in about 5 years now? Glad to hear its still thriving. The best AYCE Korean BBQ in town and probably still is. I would occasionally go at lunch time to avoid the rush, and I think the price point was softer compared to the dinner rate too. Thanks for the update! They were pretty busy by the time we left! I was glad we got there early (and not only because of the smoke).